Recently I learned about the #MadeWithChobani project, and I couldn’t resist joining in on the fun. Now, here it is, several inches from your nose (the recipe that is), and I couldn’t be happier with my creation. I love quesadillas, but they’re not all that exciting alone. In my mind, a quesadilla without sauce is incomplete or unfinished, like cupcakes with no frosting. 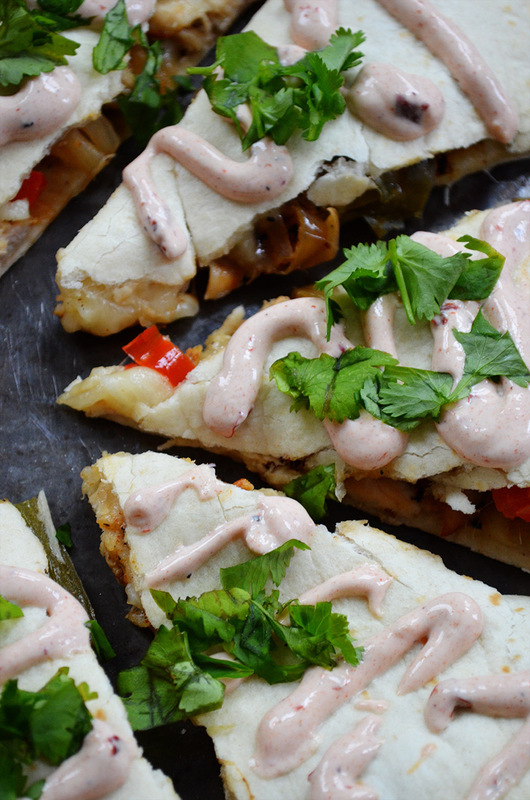 I created a hearty chicken quesadilla with a healthy chipotle sauce made with Chobani Greek Yogurt. Chipotle sauce is typically made with mayonnaise, which we all know is scary and dangerous stuff, especially for our hips and thighs. Reinventing chipotle sauce using greek yogurt instead of mayonnaise is my greatest contribution to society yet! This sauce is a little spicy, but you can moderate the spiciness level by adjusting the amount of adobo sauce you add to the mix. The quesadilla itself is delicious, but I wouldn’t call it perfect unless it’s served with this chipotle sauce. Combine all the ingredients in a food processor. Pulse for about 15 seconds, until smooth. Use immediately or cover and refrigerate. In a medium size mixing bowl, toss together the onions, bell peppers, lime juice, ½ teaspoon salt, and ¼ teaspoon freshly ground black pepper, then set aside. In a small bowl, mix together the garlic powder, cumin, taco seasoning, ½ teaspoon salt, and ¼ teaspoon pepper. Sprinkle the seasoning all over the chicken. Heat 1 tablespoon of the olive oil in a large skillet over medium-high heat. Place the chicken in the skillet and saute for 8 minute on each side, or until the chicken is fully cooked. Remove from the skillet, allow it to cool slightly, and dice into cubes. Heat up the remaining tablespoon of olive oil over high heat in the same skillet, then add the onions and bell peppers. Cook until they are soft and slightly blacken, about 8 minutes. Plate and set aside. Preheat the oven to 375 degrees F and line a large baking sheet with foil. Coat one side of the six tortillas with cooking spray, then place three tortillas on the baking sheet, coated side down (if they don't all fit, bake in batches or use multiple baking sheets). 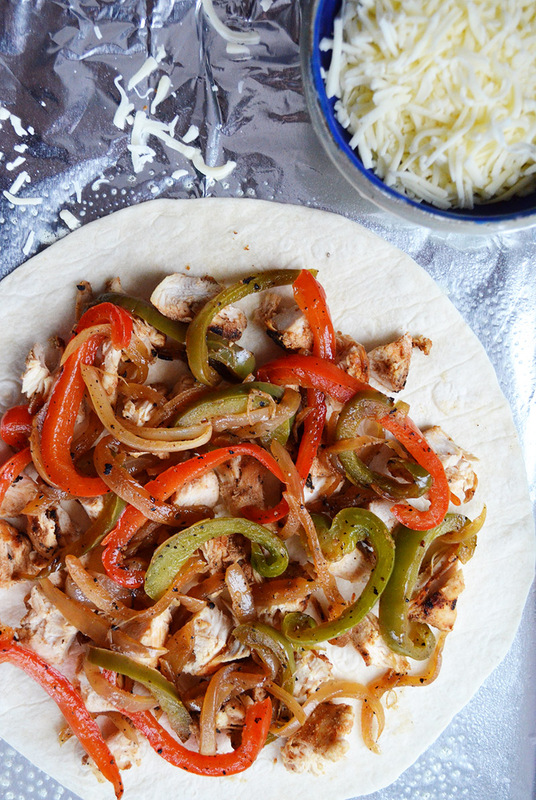 Top with chicken, peppers and onions, and cheese. Cover with remaining tortillas, coated side up. Bake for 10-12 minutes, or until the cheese is completely melted. Drizzle with chipotle sauce and sprinkle chopped cilantro on top, then serve warm. For easy drizzling, pour the sauce into a medium-sized ziplock bag and snip off one corner, then squeeze over the quesadillas. This entry was posted in Entrees and tagged chicken, Chobani, Mexican, sauce & dressing. Yum!!! Love that you mixed chipotle into the yogurt! 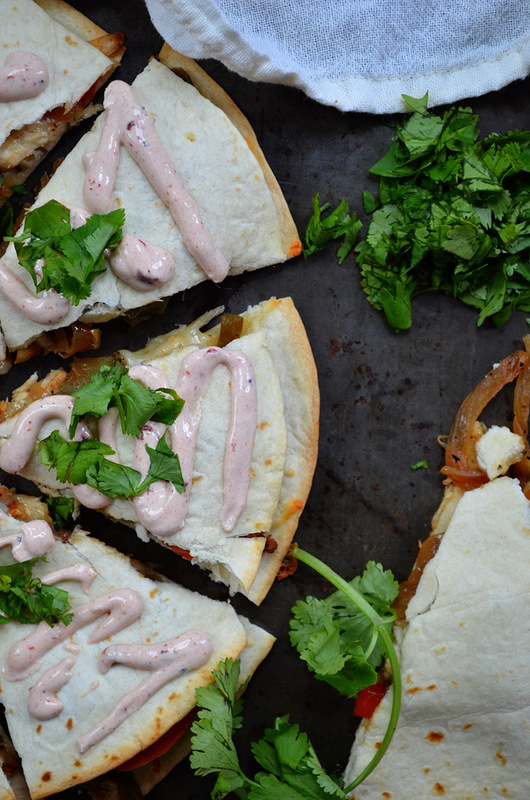 Such a good idea and a perfect topping for these quesadillas! Thank you Lindsey!! 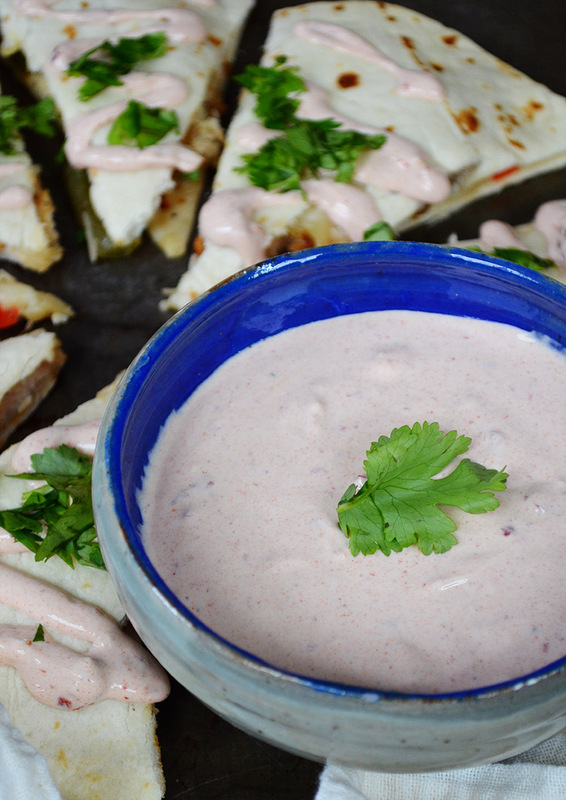 Who knew chipotle peppers and a little garlic in yogurt could be so delicious?? What a fantastic dinner! Love that you used greek yogurt in the chipotle sauce, looks so creamy and delicious! These are by far the most stunning quesadillas I’ve seen. That sauces sounds wonderful! And your photography is so lovely. Thank you so much Jen! You are too kind (: I had a blast publishing this post and eating the quesadilla! 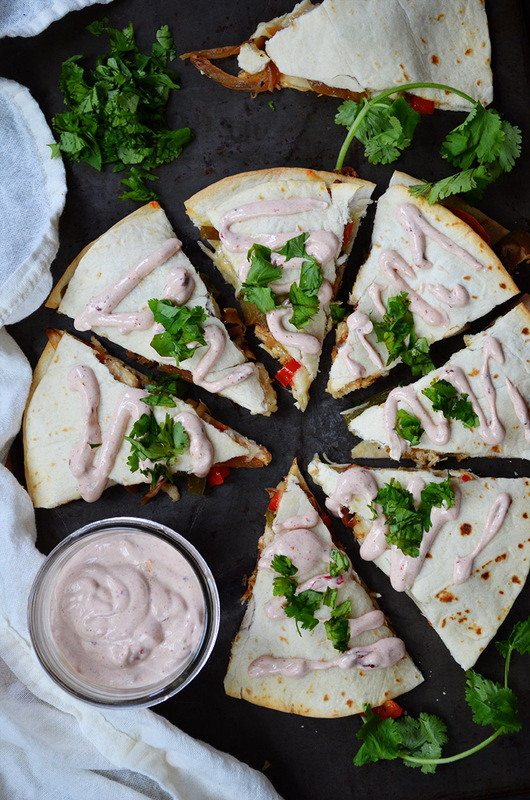 I love quesadillas, and that chipotle yogurt sauce looks heavenly!